Getting really close to the end now. I could spare a few hours in the middle of the day for the table project, so after a few morning errands I made my way to the Studio. I had picked up some lunch on the way, but I set it aside for just a few minutes. Moved the last two tabletops to a work table and glued the corner wedges I made a few days ago into the corners of each frame. That's the last time for that step. Left them to dry while I ate my lunch. The next step was to finish assembling the last of the legs. 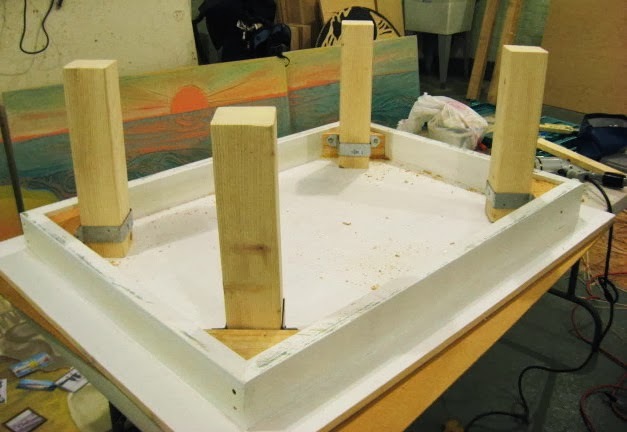 This just means attaching the deck post ties to each leg. Got into a good rhythm and it went quickly. Numbered these sets as 10 and 11. 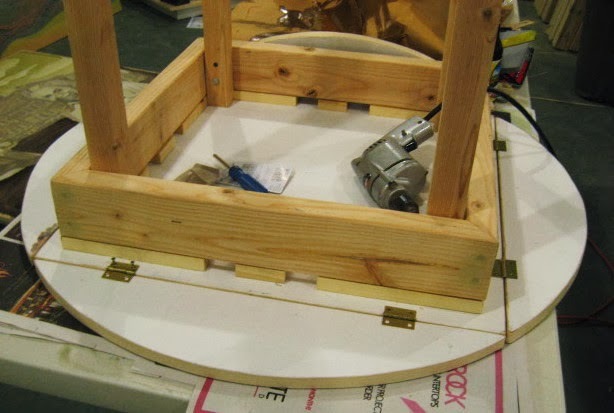 The original plan for this project was for me to make all the parts, pre-drill the holes, and then everything would be delivered to the various destinations and be assembled on site. However, that plan changed when a reception was arranged for the project and Molly wanted them to be displayed as completed tables. This was good because I got confirmation that my table design would work, and because we got to see them all in one place. Three table tops have yet to be carved, and these were the ones that got the chalkboard paint and were just displayed on top of folding tables. However my part is now done, so you get to see how this would have worked in the original plan. Each leg is individually coded with number and letter, so it corresponds to a specific corner. I drilled the holes today, but the lag screws stay in the box. The tops and legs were leaned against their respective walls in the table shop and I called it a day. Anyone who can read should be able to take it from here. I still would like to make a modification to the drop leaf table, but that will have to wait a few days. On my way up to purchase more materials for this project I could hear my cell phone ringing. I managed to pull off the road and dig it out of my pocket before it stopped ringing. It was my brother, letting me know about a little family get together later in the afternoon. I continued to my destination, where I bought enough deck post ties and lag screws to make the last of the tables for the project. Went right to the Studio to do a little work, but now with not that much time before I had to leave. I went with two quick tasks. I wanted to see if my idea to improve the sliders on the drop leaf table would work, so I cut a few short lengths of some scrap molding, and glued it to the underside of the tabletop, tight by the path of the sliders. Though the sliders do the job, pulling them out isn't easy, partly because there's not an easy way to grip the handles, and partly because the guide holes are not super snug, and the side to side movement allows it to get a little stuck. 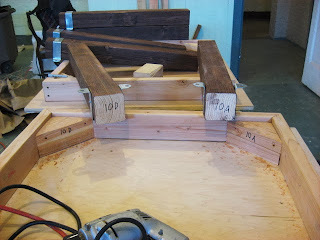 The pieces of molding should force the sliding unit to stay in the correct line from end to end. I did two, the top and bottom units in the above photo. It did seem to help, but I need to rebuild one of the others, so I'll wait and do the other guides after that. While the glue was drying on the slider guides upstairs, I was down in the table shop making the last of the corner wedges. Glued the corners cut yesterday into pairs, making two sets of four doubled corners. 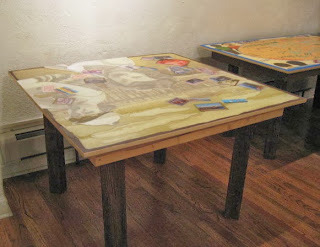 As I finished each set I moved them to the side to continue drying, then put the table upstairs back where it had been standing. After that I took off. Next time, I'll glue those corners in place, finish assembling the leg units, and maybe even pre-drill the holes for leg attachment. The reception for this project has come and gone, but we're not quite done yet. My part of this is close to the end. 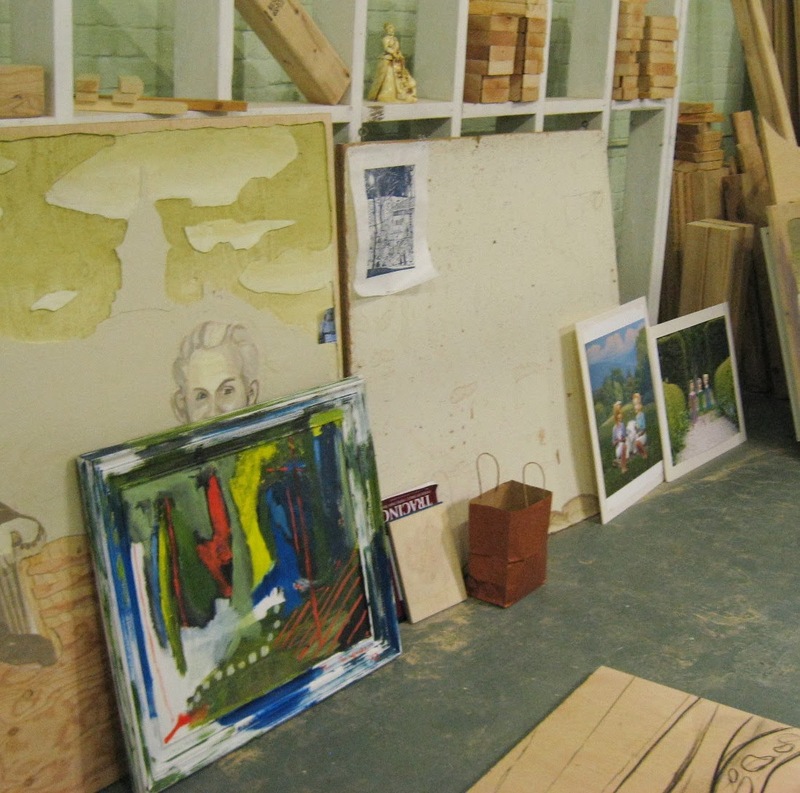 I went to the Studio today with plans to finish as much of the remaining tasks as possible. I opened the door to the table shop and was hit with a blast of cold air. 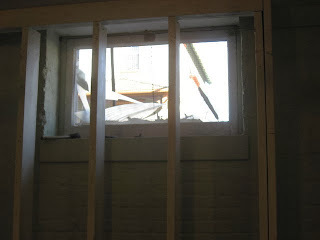 One of the windows in that room tends to flop open on its own, so I figured it was that. Instead, the window was gone, shattered. Those of you not in New Jersey may not know that we've had some winter like weather in recent days. No snow, but bitter cold temperatures and yesterday some extreme winds. My guess is that's what caused it. Whatever happened, cold air was pouring into the room. It took a while but I finally located Herb in the building and let him know what was going on, then I added a layer of clothing and got to work. First on the agenda was sanding the last of the table legs. I had one set remaining to sand when Molly asked me to concentrate on other tasks, then wanted to halt all those things that generate sawdust while she was mixing and pouring resin. So I set up my sanding braces one last time and took care of them. That's it for sanding on this project. As I was near the end of sanding, Herb came down to inspect the window and clear away some of the broken glass. I wasn't in his way, so I just kept working. 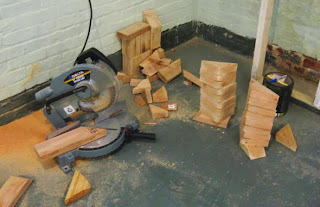 Next job was to make more of the corner wedges. 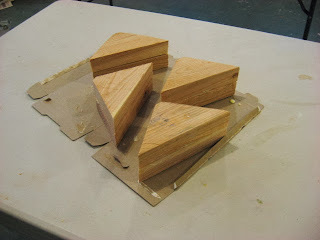 The 2x4's that had served as the braces to keep the legs in place while I sanded them were no longer needed for that purpose, so they were cut into 16 triangles of the proper size to make 8 corner pieces, enough for the two tables that still lacked them. And that should be the end of sawing for this project. 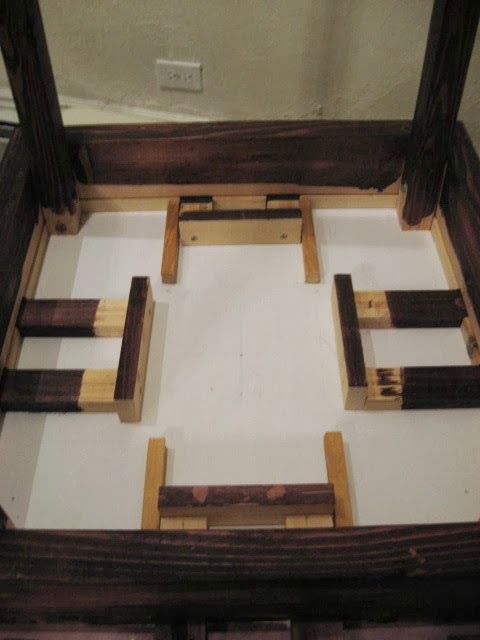 The legs will need attached deck ties for the table assembly, and all three sets of legs lacked them at the start of the day. I attached four to officially finish one set of legs, then had to end my work and clean up. My supplies include one one more set of four ties, so I will need to buy four more to complete this job, along with a set of lag screws. As I was finishing that, Herb was finishing his temporary repair. Within seconds the room temperature jumped 5 degrees, and continued to rise during my clean up. He told me something more permanent will come tomorrow. I expect to be back there again myself, but meanwhile I got a little closer to being done with Table Talk and getting back to making some woodcuts. The big day has arrived. I got up to the Studio around 10:30 am. I had stopped to pick up some more hardware on my way to school yesterday and that was still in the car. I didn't know what Molly would want me to do in the morning, but I knew we had a few incomplete tables and that there would be something. 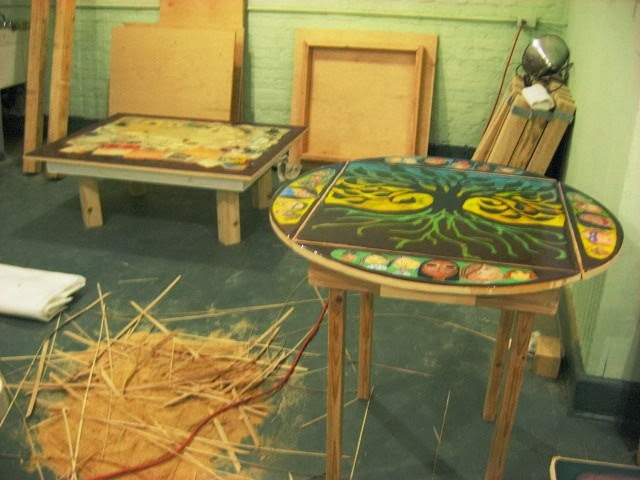 Those 90 minutes leading up to the show she went back and forth on what would be done- the Herb table (re-poured since Thursday and looking better) or the three Asbury Musical Heritage tables. 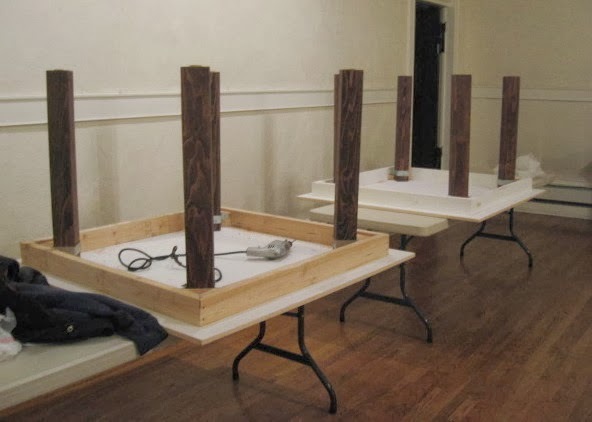 For the latter I had finished making the table tops three weeks ago, and the three sets of legs existed in various states (all cut, most sanded, some stained, none with deck ties) but the tops hadn't been carved yet. One of the things Molly advertised was art activities and she had the idea to paint the tops temporarily with chalkboard paint and provide chalk for people to draw pictures. At first she told me to start the process of attaching legs to those, which meant cutting some more wooden corner wedges, and I got a bunch of those done and glued into the corners of one table top. Then she changed her mind and wanted me to finish the Herb table instead. 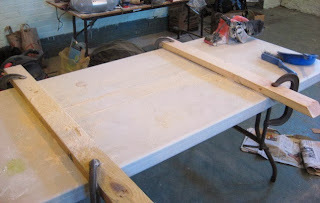 I still needed to prepare four legs with deck ties, which I did in the cafeteria, as she was doing some last minute sanding in our table shop. She had some extra help in the morning, so while I was finishing the legs she had the top, the corner wedges, and some of the equipment brought upstairs. 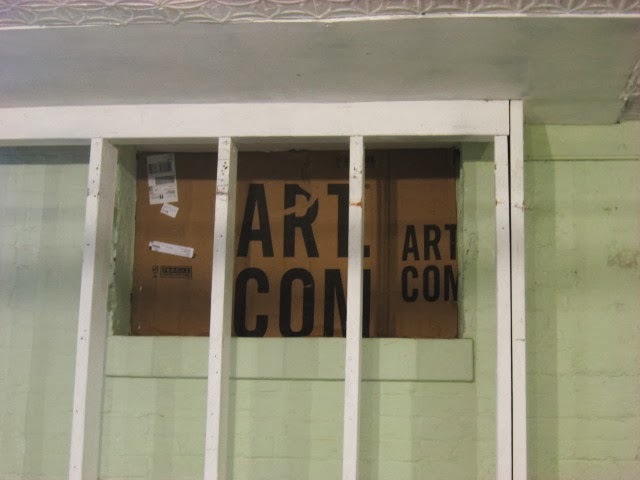 I set up a workspace by the main theater entrance, behind the stairs from the display of tables, and got the wedges glued in, drilled the holes, and inserted the lag screws while some extra help saved time by screwing them in. Put the felt pads on the bottom of each leg and flipped it up, just in time for our noon opening. After stashing my tools and supplies back in the basement, I changed clothes and joined the reception. As people entered the show, they passed those chalkboard tables, now laid out on big folding tables. All during the reception visitors had fun drawing on them. 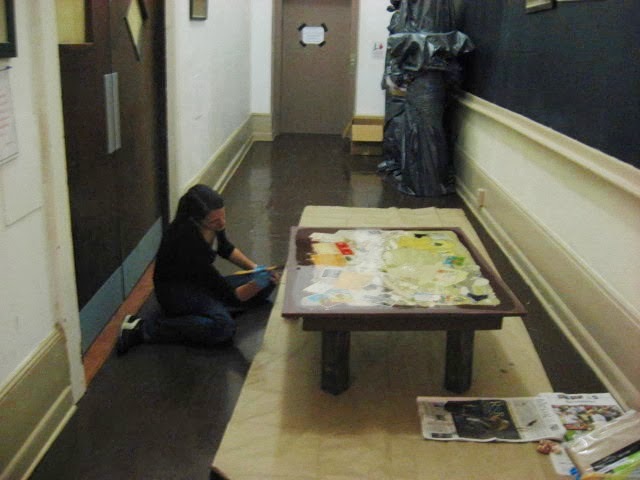 Molly had finished pouring and sanding all the six cafe tables, which were put on large folding tables in the middle of the lobby area. 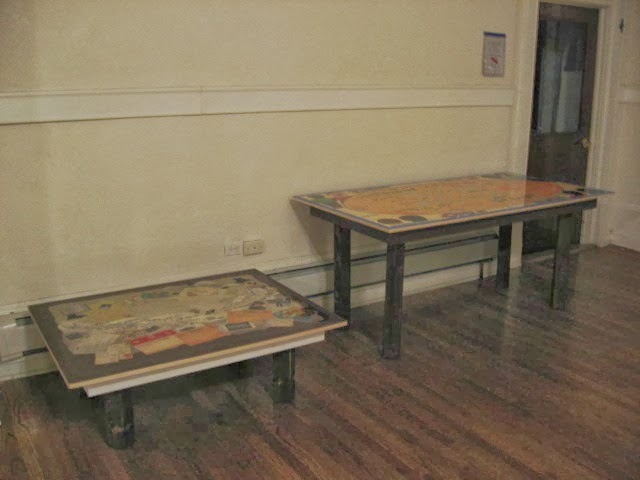 The rest of the tables were more or less where we had put them during the week- most along the walls leading to the corner where Herb's office is, and a few over by the costume shop. 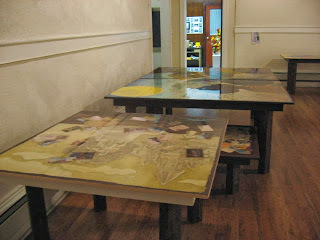 This layout allowed plenty of room for the visitors to move around the tables, and yet filled the space nicely. 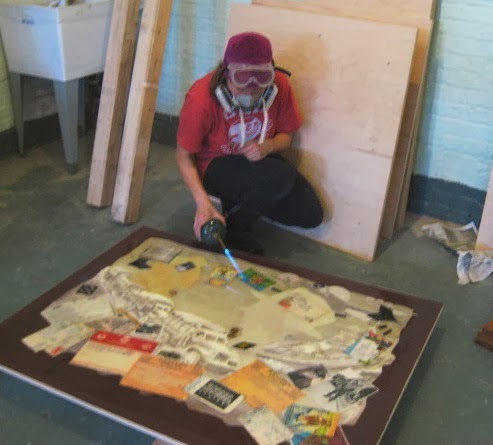 A surprise for me was that a dozen or so photos of the process had been blown up large, mounted, and hung on the walls around the room. 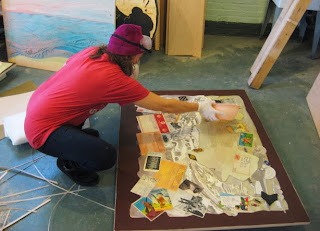 Some showed the events where groups had contributed art ideas to each piece, while some showed the art making process. Most were from Molly, but I recognized some images as shots I had taken and posted here. 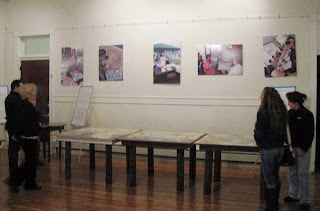 Easels by each set of tables told some stories about the tables created for the specific locations. Today the tables were for art only, so we did our eating standing up. 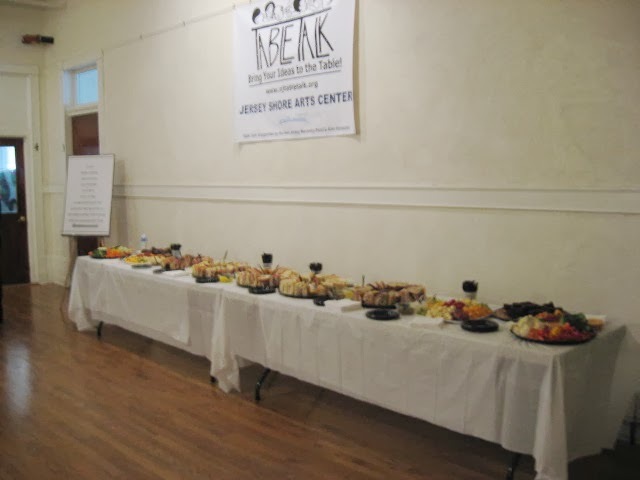 Wegman's donated a large amount of food- platters of sub sandwiches, cut up vegetables and cheese, cookies and brownies, as well as beverages. We had quite a few people turn up at the reception. I had got reminders out to our critique group regulars and some came by. 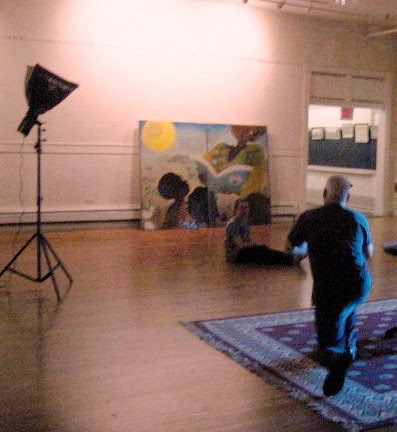 A bunch of people connected to the funding organizations came to to see the show and helped with the set up. 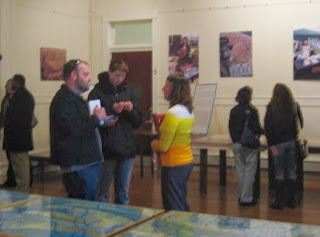 And people from some of the locations that will be getting the tables were there, too. 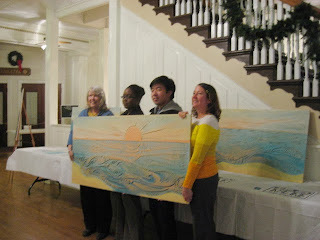 Above, Molly is shown with people from Mosaic Ministries, for whom Molly made pieces for an altar in their Belmar church. 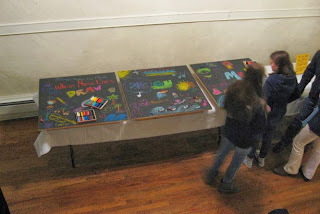 Below, by the end of the reception, the chalkboard tables were very colorful. Unfortunately, the reception ended and the public viewing will soon as well. A few still need some touch up work over the next few days, and the chalkboard tables were brought back downstairs so that Molly can carve the tops to represent the past, present, and future music heritage of Asbury. (meanwhile, I'll finish making the legs that will go on them) Arrangements are being made to get the completed tables to their intended destinations, where we are sure that people in those places will love them. Response to the idea was very positive and there are reports that other locations may be interested in something similar, but whether that involves Molly or myself is yet to be determined. Our reception deadline is fast approaching and Molly is getting everyone working on the project. 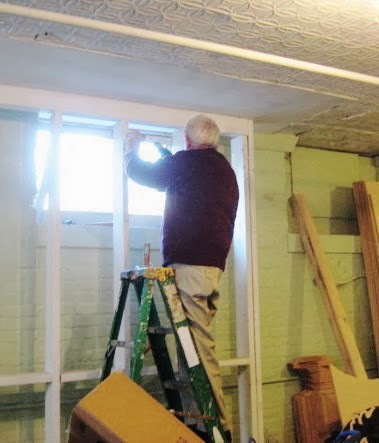 Even our benefactors at Arts Horizons (the people funding this project) are popping by to lend a hand. One of the tables that Molly poured last night will have to be redone, but that still left two tables ready for final assembly. She took a break from working on the cafe tables to help me bring the two tops (from the JSAC project) upstairs to our main hallway assembly area. (Molly was working in the cafeteria today-we are just all over this building) I had one last set of fully finished legs. Plenty of cut, sanded and stained legs as well, but without the deck ties already attached, so I had to do that this afternoon for four legs. After that it was pretty much the same as yesterday. After I was done cleaning and putting away my tools and supplies Molly came upstairs to help me put the tables up on their new legs. The two newest ones still need their frames and other trim painted, but I think she has someone lined up to help with that tomorrow. Above and below you can see all the finished ones, pushed against the walls to keep them out of the way of the many people who regularly use the building. 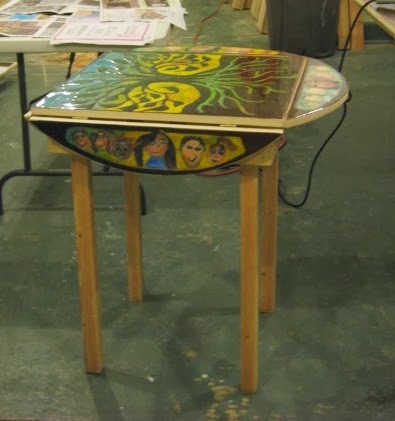 By the way, the phone interview I did yesterday while attaching table legs turned out to be for the Asbury Park Sun, an online publication. The story was up by last night. Gives some nice information about the project, includes a couple of familiar photos, and the author even managed to find a good coherent quote from whatever ramblings I had given her. The article can be found on their home page, and based on other listed articles, should be there for at least a while. Getting close to that Saturday reception now, and still a bit of work to do. 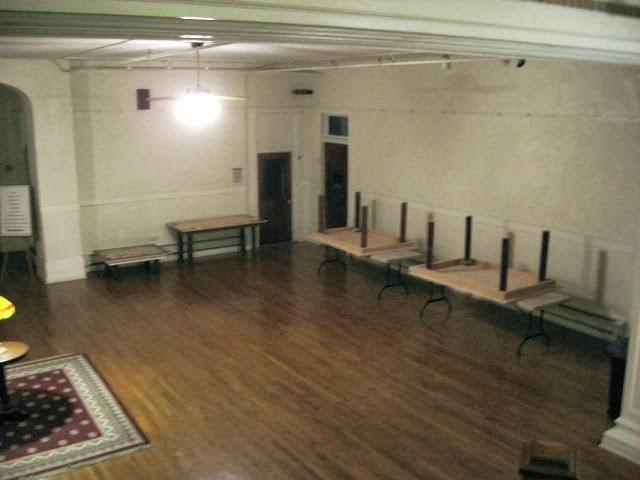 Molly had told me on Monday that she would arrange to get the two largest tabletops (Boys and Girls Club) upstairs for Wednesday. Don't know who did it, but they were up there when I arrived in the early afternoon. She had someone else busy staining all the table legs and was busy cutting some newly acquired vintage photos for the JSAC tables, all while talking to her photographer. That's right, Molly was getting ready for photo shoot celebrating this body of work. 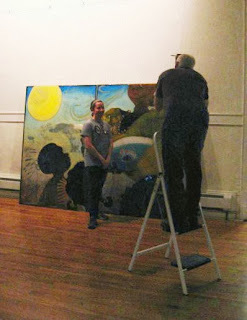 Molly helped me bring two more tabletops (Park Place) up to the first floor, then went back downstairs to continue the collage process on the three JSAC tables. Meanwhile, the photographer was busy setting up lights and equipment, and taking hundreds of test shots of the tables, to check light exposures. (digital photography offers options that we didn't have in the film days) After about an hour of all that they finally both started, and I think several dozen photos were shot in a variety of poses and angles. (again, in this digital age, this did not take too long) Above and below are just a few examples. Then she ended the session so she could get back to work in the basement. Meanwhile, I had some tables to finish. Molly's last act before returning to her basement task was to help me put one of the Park Place tables up on a plastic folding table. During the time when the photo shoot was being set up I had used a borrowed cart to bring 16 table legs upstairs, and in other trips got the doubled corner wedges, drill, lag screws, wood glue, and my ratchet set. I was about halfway through attaching legs to the first table when Molly came back upstairs holding out her phone; a local newspaper doing a phone interview with her wanted to talk to me as well. So I answered a few questions and walked her phone back downstairs to where she was getting ready to pour the last three tables for this weekend. I finished the first table upstairs, and then got a little first floor help to switch it for the other Park Place table. 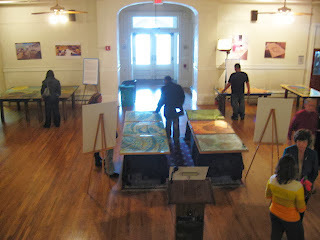 When that was done I got some additional upstairs help to move the second one, and then to put both the Boys and Girls Club tables up on folding tables. These needed the corner wedges glued in first, and then it was just like the first two. Lots of people with connections to the dance classes were wandering through the lobby, but by that time no one who could help me move tables, and Molly was in the middle of pouring the freshly mixed resin, so I just left the last two tables up where I had built them, swept up, put away my tools, and went home. Molly tells me the last three table surfaces should be stable enough to add legs by tomorrow afternoon, so as of now that is the plan. I'll go in and if it looks good, we'll get them upstairs and I''ll go through all the steps to add legs to each. I checked the inventory and we seem to have enough of every part to complete these last three in progress. More materials will be needed to finish the last three tables in shop, still not carved, but that's a problem for next week. Getting close to our table reception, which means work has to get done. Got to the Studio around 1 pm with a list of jobs for the day. Molly wouldn't be in for a few hours yet, so I had to look for things I could do before her arrival. No other table will be getting legs until after they are moved, but I figured I could install some of those corner wedges. 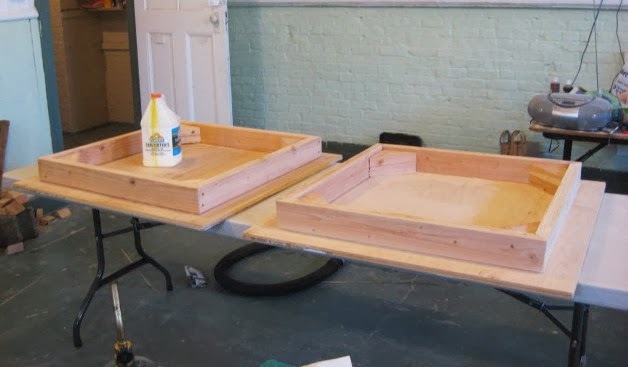 For example, the two Boys and Girls club tables were sitting face up on a work table, so I figured I could flip them one at a time, glue the corners into the back, and then flip them back once the glue was dry. 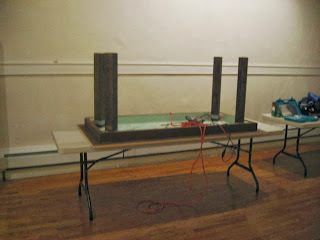 However, when I actually tried this I realized that these tables are a bit too large for me to do that myself. Not so much the weight as the large size is awkward to move around and I didn't want to risk damaging the surfaces. So time for plan B- one at a time I moved the Park Place tables, then leaning upright against a wall, and placed them face down on a work table. 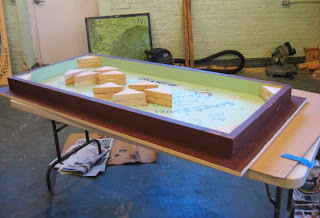 I had about a dozen doubled corner wedges ready to go, and glued four of them into the four corners of each table. I wanted to let the glue dry before moving them back to the wall, so I took advantage of this horizontal time to make more of these doubled corners. Made eight on each table, for a total of 16, which will be enough for all the tables that we are expecting to have ready for Saturday's event. That was when Molly arrived. We went over our work plans for the rest of the week. While she was there we moved those two large tables, leaning them upright, side by side, against a wall. This is the first chance we've had to see them like this since they were just line sketches. Molly's plan was to continue pouring tonight and again in a few days, and we're going to get help from our building to move these tops upstairs. In a few days I'll be back there, carrying all the prepared legs and hardware up to the first floor and continuing the process there. One week from today we are holding a public reception for this project, and that will go a lot better if we have some actual tables to show. If the cafe tables are shown it will likely just be the tops, since the restaurants will be providing their own pedestals when they are deployed. Of the rest, nothing is exactly done, but some are close enough that we want to get them finished in time. In our brief conversation Thursday Molly indicated that I could add legs to the Bella Terra coffee table, plus finish the sliding supports for the drop leaf. 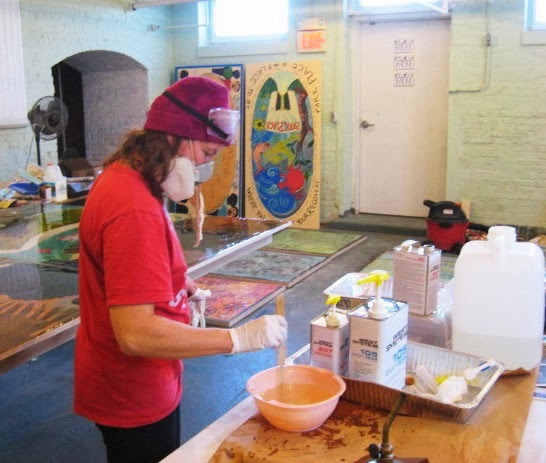 When I arrived in the early afternoon the resin fumes were long gone and I could get to work. Decided to tackle the drop leaf table first. 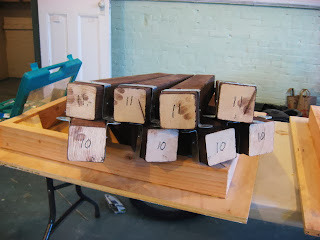 I had worked out the measurements of the sliding support pieces and bought the wood to make them during the week. Each unit consists of two sliding pieces and front and back stops. Slid all the way in, it will sit behind the hanging leaf. Pulled all the way out, it will support the leaf without extending past the circumference of the round table. Like everything else, working out the first one (above) took the longest, and it went much faster with the remaining three. 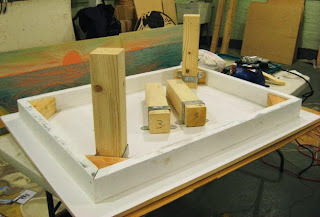 I constructed the whole thing upside down (below) on one of our work tables, but had it back upright on the floor for the final test. One was a little stiff and may need some readjustment, but all of them go in and out and have the table ready for Friday. 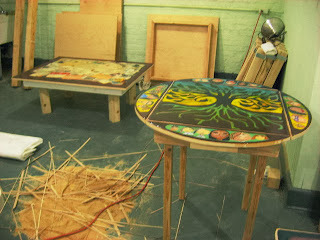 After that the coffee table (as we're calling it around the Studio) for Bella Terra. This is the one that Molly was pouring a few days ago. 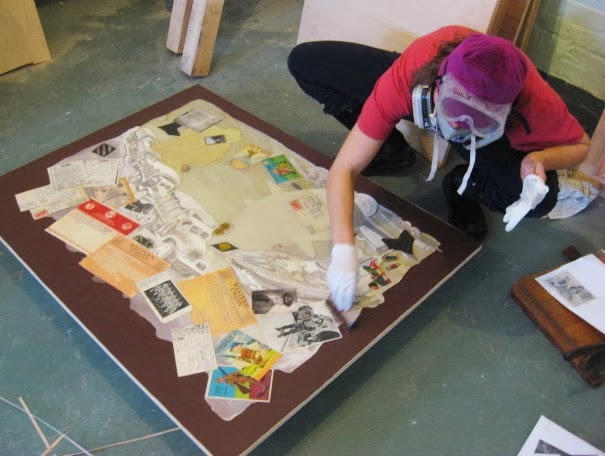 That process is not yet done, but at least all the collaged items are now secure to the top and I could safely pick it up and flip it without risking the damaging of those items. With the drop leaf table done, all the rest of the legs will be the thicker 4"x4" wood, held in place with lag screws through the deck post ties and into the frame. 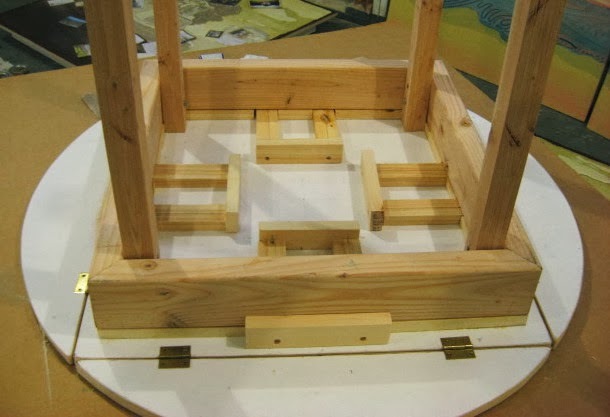 Between the legs and frame in each corner is a triangle piece made from 2x4 scraps. The other day Molly specifically asked me to glue these in place before screwing it in place. This is not a bad idea, as I believe her plan is to take apart most of these after the reception, to make the shipping easier. Although the construction plan is identical for all four corners, everything is hand drilled, so the legs will not be completely interchangeable. 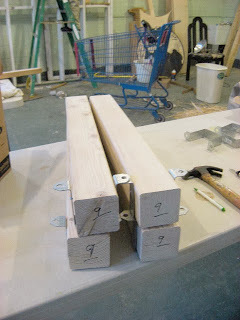 So the corner wedges are glued in place and the legs numbered individually to a specific corner. Although this is the first table of this style to have the legs attached, I built several sample corners in this style, so it all seemed familiar. At the end of my workday, two tables standing. 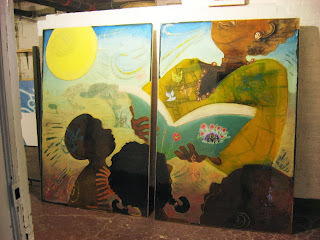 I believe that Molly will be painting the frames and legs, but my part of each of these is over. I spoke to Molly by phone yesterday and she told me that she hoped to pour some more tabletops today, probably around mid-day, so if I was planning to come in and work, I'd need to get there early. The resin she uses is not something you want to breathe a lot of. So this morning I got up at a decent hour and was just getting into my car when the phone rang. It was Molly telling me she was about to pour, so I probably wouldn't want to come in and use the Studio. So instead I figured I'd take care of some errands in the Neptune/Ocean Township area (including buying a little more wood for this project) and end up at our building later. Pulled into the lot around noon and saw Molly's car still there. It took me four trips to unload all the print supplies from last night's class in Belmar, but I still had time to get some action photos of Molly at work on the project. 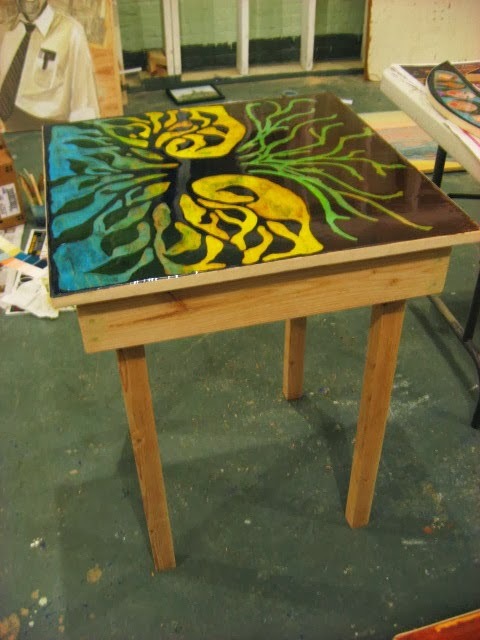 Above, mixing the epoxy type resin, below, pouring it on one of the table surfaces. Once the resin is poured, she spreads it out while it's still liquid, covering the whole surface. After that, the blowtorch is used to improve some bits of the resin surface. The photos taken, I got out as quickly as possible. (she's not wearing that mask for nothing) I should be able to go in over the weekend and continue adding the legs to some of these tables. 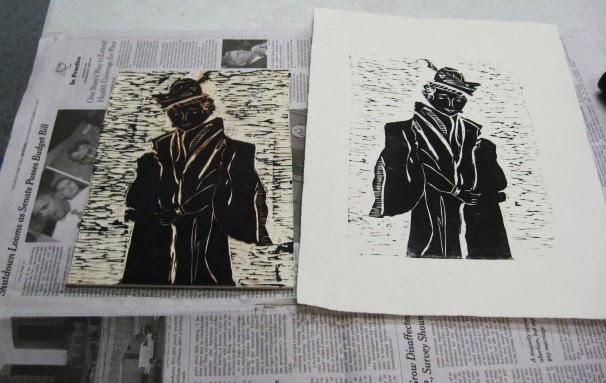 This current series of woodcut classes in Belmar has only two students, and because each had some scheduling conflicts, sometimes I had only one or the other present in a given week. 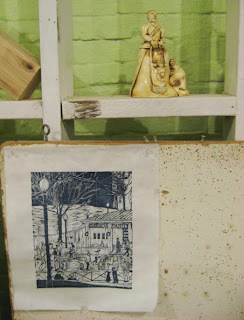 But for our last meeting of the season I had both students there and producing prints. 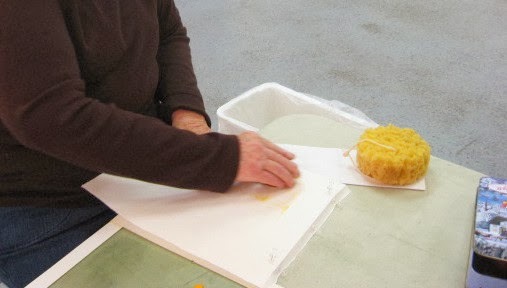 Mary (above) brought in her white line leaf print that she had started inking last week. Lots more color on it now (you can see a little piece of it at the top of the photo) and she continued to layer it on tonight before setting it aside to try inking a new small print, a potential Christmas card. 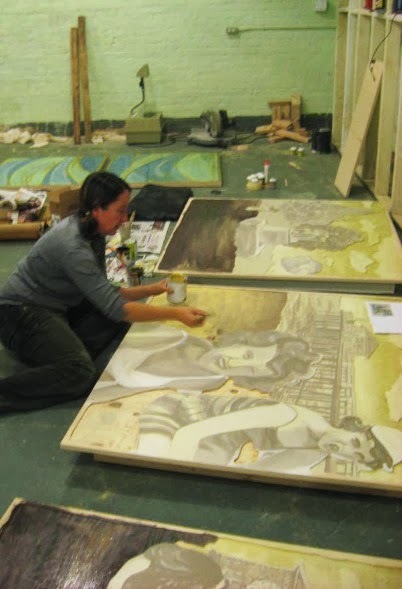 Carolyn had missed last week, but used her time away to finish cutting away the negative space around the figure. She borrowed one of my V gouges to finish cutting some details and we pulled a first proof just as the class was due to end. And with that, another year of woodcuts in Belmar draws to a close. No one has time around the holidays for classes, including me, so we'll be taking a break until early next year. No need to worry about my regulars from tonight- like most of my students they invested in their own tools, and will likely continue cutting on their own into the new year. 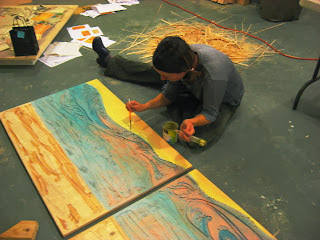 I had dropped by the Studio a few days ago to check on the progress of the table project and found Molly hard at work. There was nothing for me to do at that specific point, but she told me she was expecting to pour the tops later that night, and therefore I might be able to continue work early this week. By this afternoon I still hadn't heard from her, but I had other errands to take care of, and added visiting the Studio to my list. Once again I found her hard at work, adding paint to a triptych that will be used to create an altar at a Belmar church. (not strictly a table, but under the umbrella of this project) I could quickly see that she had indeed gotten some pouring done. She mentioned that she was expecting a visit tomorrow from the organization that is financing this project and would really like it if we had something put together to show them, and really hoped it would be the drop leaf table. For many practical reasons it would be the best choice for one to be completed tonight. I didn't have anywhere else I had to be right away, so I gathered my tools, cleared off half a table, and got to work. It made sense to take care of the legs first, and the flaps after that. 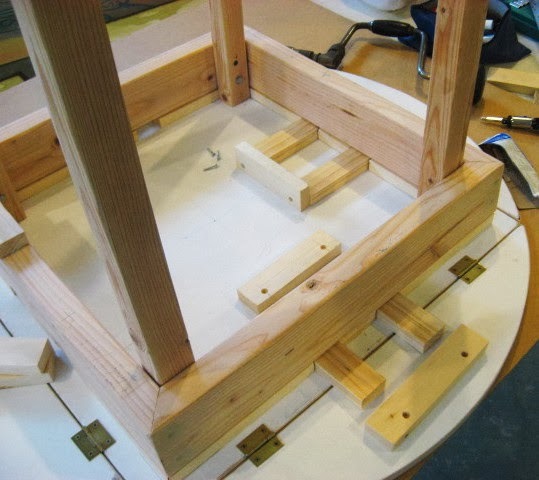 Every other table leg in this project is a 4"x 4" and will be attached with deck related hardware, but for these much thinner legs two screws through the leg and right into the frame should suffice. 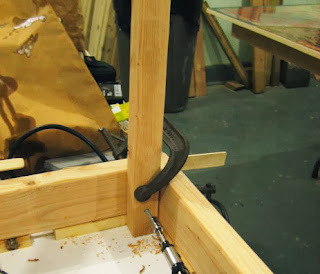 I clamped each in place (above), used a level to make sure it was straight, then drilled and drove a few screws. And with that, we finally had our first functioning table (below). I put the table back up on my work table upside down and moved on to attaching the leaves. I checked with Molly to make sure of which one went on which side (there was a specific order) and then tried the first one. The tiny screws were causing problems at first- figuring out which one of my phillips head adapters would best fit them and getting them started. My quick nail driven pilot holes weren't cutting it, so I carefully drilled them with one of my tiniest bits (carefully because I didn't want to go all the way through to the table surface) and once I had worked out the system it went quickly. Finished all four sides and set it up on its legs again. At that point I had to get going, so I'll leave the construction of the sliding leaf supports until later in the week. For the purpose of demonstrating how it will work, I slid some 1" x 2" scraps into the guide slots on two sides of the table, and it turned out my cantilevered idea worked as expected. Meanwhile, Molly had continued painting, first on the altar set, then moving on to the three large tables that will be for the Jersey Shore Arts Center. At 7:00 we both decided we were done for the night, packed up, locked up, got into our respective cars, and took off. Last week, one of my woodcut students told me that she'd have to miss this week because of a family commitment. When I saw Mary at Monday's critique, she offered to just stay home so I would not have to come in tonight just for her. Of course I told her I'd be there for class as usual. First of all, I've already been paid and I always honor my contracts. Second, I wanted to see where she'd be going with this new process she had learned. 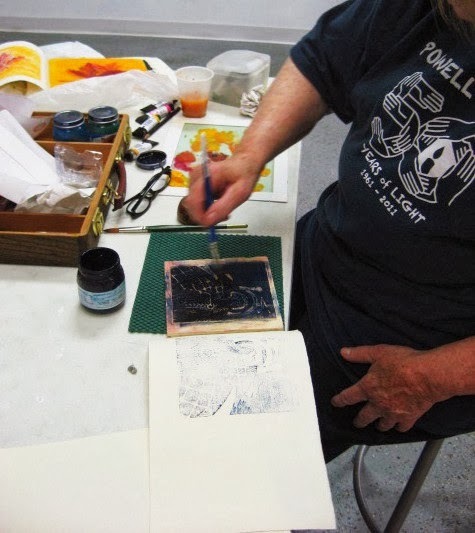 She had told me she'd be attending a workshop about Japanese style woodcutting, but when she returned, she talked about learning about the Provincetown style, which is a white line technique. Last week during our class she cut a white line image of a large leaf as the first step. She started tonight by cutting a border. 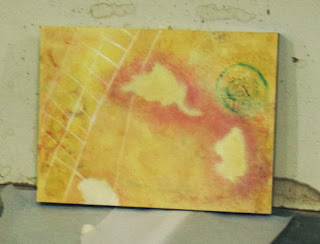 A piece of heavy print paper was tacked to one edge of the block, outside the cut area. Instead of the printing inks she's grown used to over the past year and a half, she started applying watercolor with a brush (see above), slightly thinned from tube strength, coloring one small piece at a time. After brushing the watercolor on one small section, she lowered the paper and rubbed the back (see below) with her favorite rubbing tool. She repeated this process for the rest of the class. 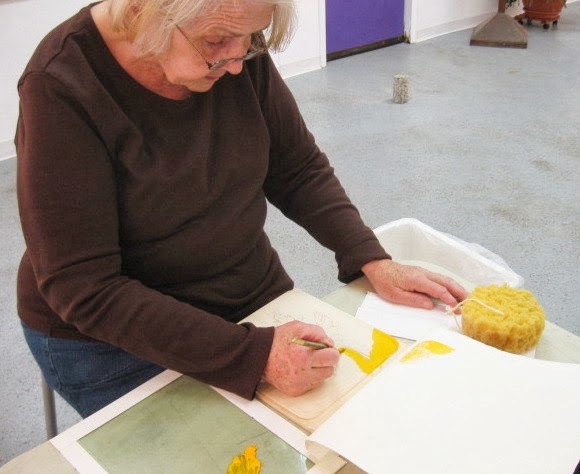 When she stopped to pack up her supplies, she had gotten as far as what you can see below- that's the block on the right and the current state of the print on the left. 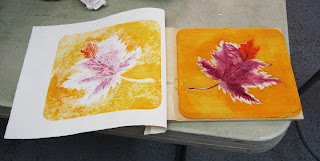 The texture of the printed watercolor is rough-mottled and granulated, but that fits well with nature of the image. This effect will make it work very well to reproduce the color variations through the whole leaf, assuming she goes with the colors in the photo she showed me on her phone. I don't know if it would work as well with her figure/building images, but I guess we'll see, if she continues to enjoy this variation. Toward the end of class she asked me if this process would still be considered woodcut. I told her as far as I was concerned, it is. A block has been cut, and the lines cut into the block are part of the image. The inking may be unconventional, and would never be able to be called a true edition, but the print wouldn't exist except for the cut image, and to me that means it's a woodcut. The weather has gotten a bit chilly of late, lows sometimes getting close to freezing. But today was a nice sunny day, light jacket weather by the afternoon. But shortly after I got to the Studio, I started noticing the cool again. I had raised the heat a little, and closed our room door to keep noise from the sander from disturbing the whole building. Later I went into the hallway and there was definitely some cold air coming around from somewhere. By the time Molly banged on our outside door to be let in, it was heading down toward freezing again, so we made sure to close that door quickly. No bats flying in tonight. Neither of us had gotten a lot or responses to our reminders about tonight, but we had six of our regulars join us for a respectable total of 8, and most with art. In the above photo, we have Tim's very colorful abstract painting (which extended to the frame) in the foreground, and two of Jill's digital collages on the far right. 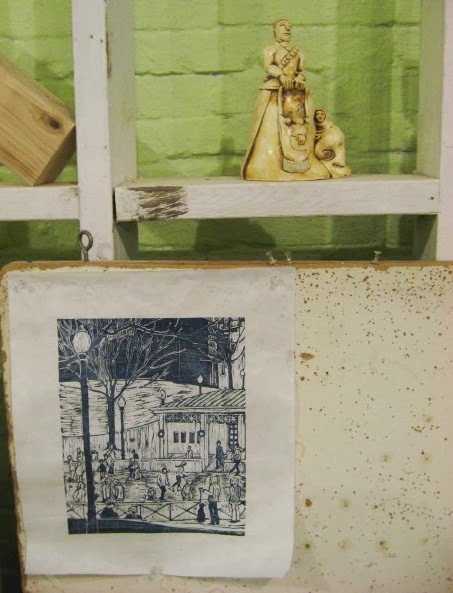 Below, a ceramic sculpture from Margery and an early proof of the woodcut that Mary started at her Boston workshop last week. 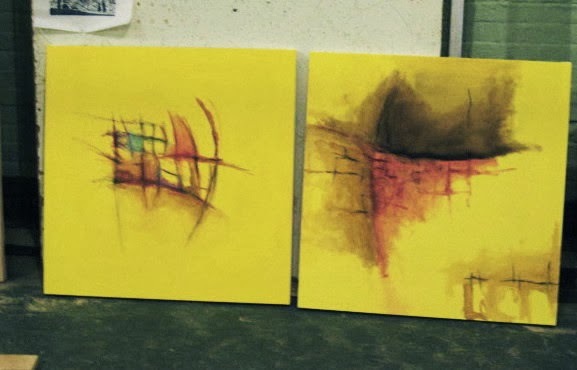 More colorful artworks came in from Vince (above) with more grid based paintings, and from Sheilagh (below) a multilayered encaustic piece. No new prints from me this time, but I did point out my growing pile of legs and the dark squares on the floor left behind when I moved the 4x4 pieces, the original floor color surrounded by a coating of sawdust. Molly had every table piece on display of course. We didn't go into detail on all of them, but those that got the most comments were the Boys and Girls Club diptych (which was just a black line sketch at last month's crit) and the three Kula Cafe head tables.